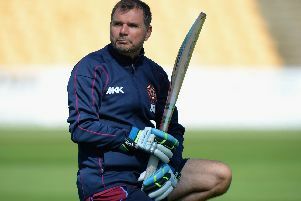 Muhammad Azharullah says Northants’ win over Worcestershire was a ‘once in a lifetime’ experience as the Steelbacks defended 126 to win by 21 runs at New Road. Azharullah took four for 22 as the hosts were bowled out for 105, with the Steelbacks sealing a win that looked unlikely when they slipped to 19 for six after Joe Leach’s hat-trick form the first three balls of the innings. However, Azharullah stressed an all-round bowling performance was key, as well as the belief of captain Alex Wakely, who inspired his team to fight all the way. “It’s one of those games, a once in a lifetime experience,” Azharullah said. “I don’t know how we did that, it was just a wonderful team effort all round. We fielded well and bowled well. “I can’t really believe what happened. We won the toss, batted first, we thought it was a good wicket, but then three wickets in three balls. It’s been an amazing day of cricket and that’s what it’s all about. Azharullah came on with the score 18 for two, striking twice to reduce Worcestershire to 29 for four at the lunch interval, before taking the big wickets of Darryl Mitchell and Ross Whiteley. He revealed that Wakely had told him before his spell that it was going to be his day and the captain’s words proved to be true. And Azharullah admitted his performance was all the more special for taking the side to a win that keeps alive their hopes of qualifying for the Royal London One-Day Cup quarter-finals. “When I came on he (Wakely) said ‘this is the wicket you want to wrap up and take with you wherever you go, this is your wicket’ and it happened. It was one of those special days you remember when you retire. “It was one of those special spells because it won us the game. “We started slowly but we’re back in the mix. If we lose this game we’re not but we’ve got a game tomorrow (at home to Somerset) and we just need to keep going.